The City Centre Chaplaincy was where Light Project Peterborough first began back in 2009. A small team of volunteers set out with the aim to engage with local businesses and shoppers within Peterborough. They did this through acts of kindness, prayer, prophetic evangelism and relationship building. Over the years the City Centre Chaplaincy team has grown, and so has this part of the project as our volunteers respond to the needs of people in the city centre community. You may see our City Centre Chaplaincy volunteers in Cathedral Square or other large outdoor areas in the city. 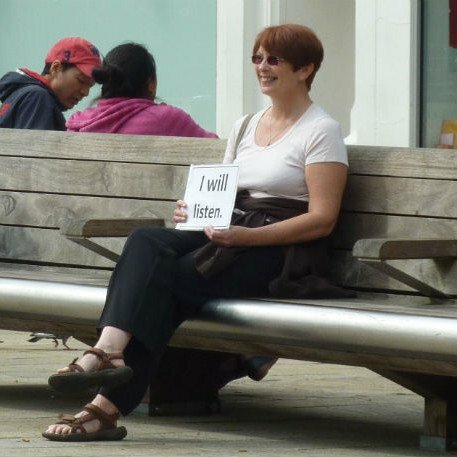 They may be stood holding signs that say “Free Hugs” or sat on a bench with the sign “I Will Listen”. Alternatively our City Centre Chaplaincy volunteers can be found in local establishments such as The Drapers Arms, The College Arms, Argo Lounge and other similar places where they will chat with locals and engage with ‘table talk’ which is a popular conversation game. Perhaps you have received a gift of kindness from our City Centre Chaplaincy volunteers. 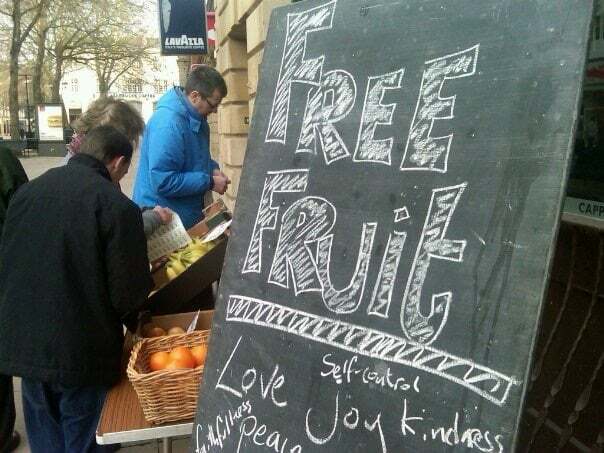 We can sometimes be found setting up a free fruit stall or giving out daffodils to people in Peterborough city centre that are working, lunching or shopping. The wonderful thing about the City Centre Chaplaincy is the reaction and response from the public. This is always a response of interest and the innovative nature of our activities often creates amazing opportunities for conversation as well as sharing our faith and prayer. If you are interested in volunteering with our City Centre Chaplaincy team then please contact us directly and we will contact you with more details. If you would like to support us financially please donate here.